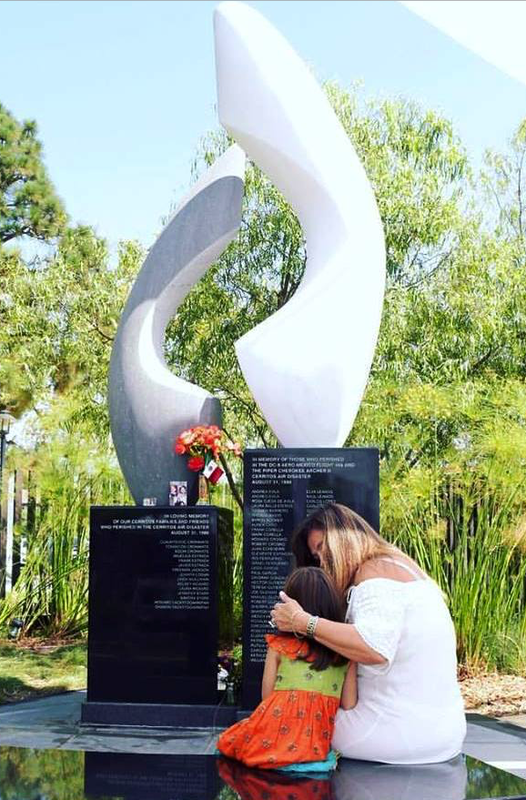 A mother comforts her young child at the memorial. At 11:56am, this past Wednesday, bells chimed out three times in remembrance of the Cerritos Air Disaster. On August 31, 1986 a Piper Cherokee Archer II plane collided with Aeromexico DC-9 midair above Cerritos, resulting in a tragedy that claimed 82 lives, destroyed eleven homes and severely damaged seven other structures. Those who perished included 15 on the ground, 64 on the Aeromexico flight and three on the smaller aircraft. The tragedy became known as the Cerritos Air Disaster and prompted the implementation of safer procedures for airport approaches and departures. Many special speakers were present today including Adriana Ocejo, Director of Culture, from the Township of Loreto, Mexico and Luis Valdez, son of Aeromexico pilot Captain Arturo Valdez. There was some good that came from that day. Air traffic monitoring changed forever with new transponders that allow aircraft of all sizes to talk to each other, ensuring a similar air disaster would not happen again. Mental health teams now rapidly deploy to disaster areas to begin immediate crisis counseling for victims, and first responders who may suffer post-traumatic stress from their experiences. Responsibility for the collision was shared by the pilot of the smaller plane and the Federal Aviation Administration. The FAA has since enforced a series of key changes, requiring jetliners to install automatic crash-avoidance systems; mandating the use of transponders operating within certain areas; and consolidating approach spaces for more organized airspace management. Cerritos came together that day in unity. The community and City of Cerritos established a fund for victims’ families. Shelters were set up for people who lost their homes, residents opened up their homes and made sure everyone had a place to go where they could sleep, eat and mourn. “I’ll never forget that overwhelming sense of community,” states Knabe. Cerritos City Councilmembers who led the community during this painful time of healing included Mayor Don Knabe, Mayor Pro Tem Daniel Wong, Councilmember Ann Joynt, Councilmember Diana Needham and Councilmember Barry Rabbit. There has not been another midair crash between a major commercial air carrier and a general-aviation aircraft, since the Cerritos Air Disaster. The number of midair crashes in U.S. airspace has reduced to single digit instances according to Aircraft Owners and Pilots Association. The Aeromexico plane, flight 498 originated from Loreto, Mexico. Among the 64 people on the flight were 15 people from Mexico. Out of this tragedy a friendship and Sister City relationship was born between the Cerritos and Loreto communities and continue to thrive today. The Cerritos Air Disaster 30th Anniversary Remembrance is held in memory of those who perished in the disaster and to provide comfort to those who lost loved ones in the tragedy.